We offer you the best bait for carp fishing in winter. With our advice, you will learn how quickly and with pleasure to catch the biggest carp. In the period of cold water, carp is not that strong. It makes the task of choosing the hook size and breaking load of a leash easier for fisher, but only on non-snags places. But if you want to catch in areas with a significant amount of snags, you can use rods made for fishing in such situations. If the carp ignores a large hook and a noticeable leash on a clear from obstacles place, then you should try to reduce the size. Remains of aquatic vegetation in winter do not cause particular difficulties so that you can sacrifice the strength of the rigging in favour of its invisibility. I had a lot of times when carp ignored the bait and eaten the lure completely. If that happens on your pond, then instead of №2 use №4 or even №6, and do the same with the leash. If you feel that you can catch the carp with a more delicate strap, then it should be used. To make the task of choosing the gear easier, I break the season in three periods. Regularly the winter in Europe lasts from 1 of November to 31 of March. And as everyone knows winter fishing in November is nothing like fishing in March. It is essential because fishery and gear will change during all winter. The start of the winter is very frequently windy, with rain and snow, first, freeze coming. Also, the significant amount of fallen leaves can help you choose your gear. In early winter I prefer floating on 5-9 cm lures. They’re more than enough, for bait to be seen, and for the garbage on the bottom to be insignificant. When all the leaves that have fallen in the water will lay on the bottom, I use the bottom lure. In the period from the middle of December and to the end of February the carp activity is lowest in the year, so it’s better to catch it with the balanced lure. I prefer to use standard bottom baits and in early March. Carp begins to wake up and can be very picky about the gear. In England, in March, the carp begin to eat. When he intensively feeds, I use baits that are most similar to natural carp food during this period. Some English fishers think that nozzles that contain fish flour won’t work during winter. If you ever hear that, ignore it. They do work, trust me. I caught a lot of carp in the winter with such baits, even on the snowiest and uncomfortable for fishing ponds. It is important to know that carp needs fats and proteins in winter in the same way as in summer, but in winter it feeds less because it consumes less energy. Carp can’t absorb some fats in winter months – it is complicated for him to digest fat in the intestine (carp has no stomach) at a cold temperature, and the body temperature of the carp is the same as water. Although individual scientific studies on this topic have not been conducted, it can be assumed that the fish that has swallowed too much fat food will feel uncomfortable. No self-respecting fisher wants the fish to feel bad, because this will directly affect the catch. Therefore, it is not surprising that anglers talk about the inefficiency of the lure with fishmeal in winter. I use lure with fish flour all the winter, which is very nutritious for carp. The only thing to which I want to draw your attention, – the content of fishmeal in the mixture should not more than 25%. I ignore any fish oil that would be added to the feed in the warm season. Instead, I add my favourite proven attractants and flavours, which will be discussed. I am a big fan of fruit aromas during winter months. Before I started working for Rod Hutchins, I used all sorts of different fruit aromas, and one of the most effective I think was Ester blend, by Solar. This mix contained 12 different fruit smells. Now for winter fishing, I use Fruit Frenzy mix, very similar to Ester blend. I used this mix for three winters, but each of the winters gave me an unforgettable carp fishing. Also, I liked Squid Mix by Nash, mixing it with aromas of Tangerine and Ester blend, I spent two seasons of winter fishing on a rather hard for carp fishing lake Orchids in England. And that mix showed itself significantly. The primary element of using aromas is their solubility. If make some tests at home in a can of water, you’ll see that different compositions of the flavours react differently. To verify this, you need to drop them into freezing rain, pre-cooled in the freezer. Take different tastes and cut them in cold water. Some will sink to the bottom; others will float upward and dissolve there, while others will hang in half-water. What you’ll see in the tests will be very important in planning winter fishing, more precisely, to select the flavour that you will use. Never dwell on one scent. Mix the taste that is falling to bottom with the one that stands in the half-water, and then add to this mixture a flavour that floats on the surface. Having done all this, you will be on the right path. It is perhaps one of the reasons why Ester blend and Fruit Frenzy work well – they fill the fragrance with all layers of water. 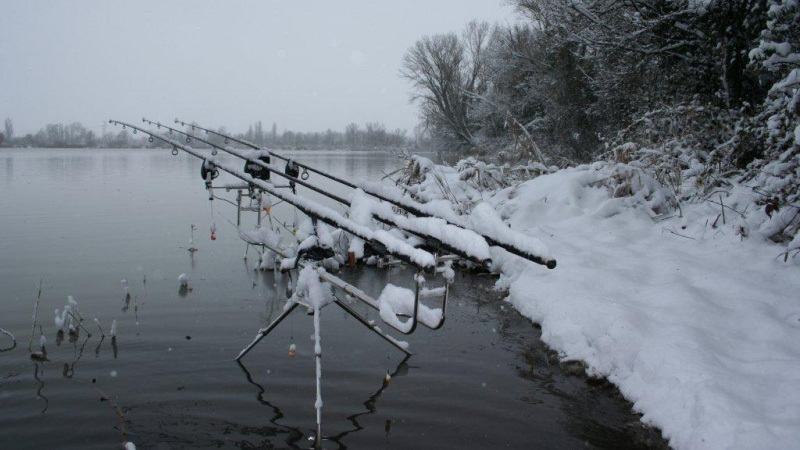 I’ll say that using only one bait during winter – is not always the best way to success. 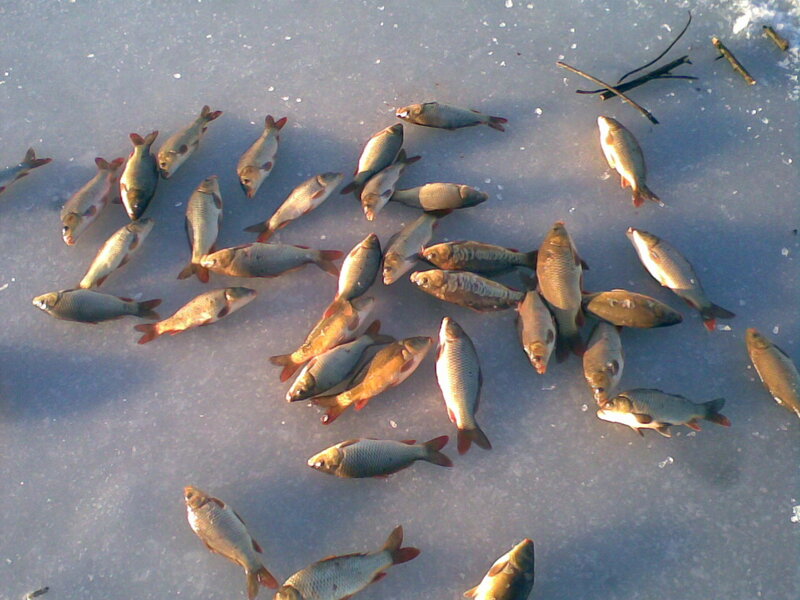 There is a stereotypical view of winter fishing – to drop a tackle with one bait and catch without any luring. If you want to successfully pass a carp in the winter, convince yourself that there are no rules, try and you will find your way to the most treacherous carp. As I said many times, all waters are different, and more importantly – situations are too. Winter in France is not like in England, but I know one bait, that will work well in both countries, and in some cases when nothing will work. I fished long enough without using a lure, only with bait and I can say with confidence that it cost me a lot of fish that I could catch, but did not. I believe that there are periods during the winter season when carp is intensively fed even in the harshest winter season. Environmental conditions will be suitable, and it will seem that the fish in the pond go crazy from lack of food. At this time, you can successfully fish with only bait without a lure. However, this happens quite rarely, and it is better to use bait. I consider people who don’t use lure as fishers of one fish, not many. When the carp are intensively fed in the winter, you need to give him what he wants – food. I always care about the reserve of a lure for carp in winter, and I take it usually more than necessary for winter fishing. But in the end, I know that if the carp eat a bait in large numbers, my chances for a catch are significantly increased. Recently I catch with two fishing rods: one I use only with bait, and the second I place on a well-fed place. The lured position gives a lot of fish, but rod with only bait still provides fish. There are a lot of strategies for winter fishing, but, I can’t tell about them all in this one article.